It seems I am really adapting to woods life. This was made very evident the other day when we walked into the grocery store. The ambiance was such a contrast to what I am now used to, and I felt like I had wandered into a strange alien world: everything seemed so bright, white and clean, and there was a constant hum. People seemed very clean, ironed and tidy, and preoccupied with their shopping. Living with less, I am for the most part content. The homestead I am at has no refrigerator, no oven, no air conditioning, simply an outdoor kitchen and a yome for the owner, a trailer with a porch for the wwoofers. I am constantly a little damp, dirty, smelly, and sun-kissed. I get tired when the sun goes down and wake up early with the birds and rooster. When I have my own homestead one day, I will be able to make some minor adjustments to make myself totally content. I think I could even get used to cooking over the open fire full time if I designed a barbeque-type hearth. I have been using the public libraries to update my blog, check email, etc. It will be interesting to see just how off the grid I can get used to! In the homestead garden, we have huge light green squash ripening. We’re not sure what kind it is, but it looks a lot like a Hubbard squash. 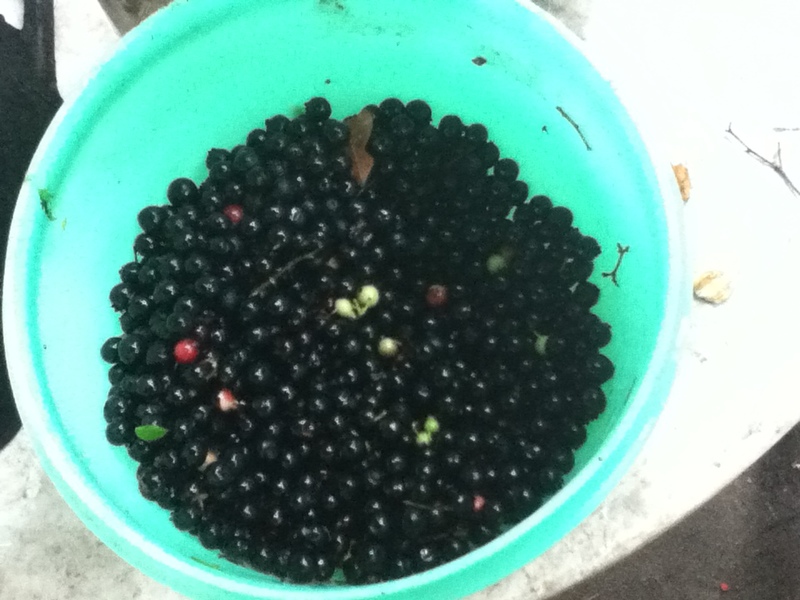 It is delicious and the fruit is so huge that I decided to get creative with ways to eat it. With sweet potato pie in mind, I decided to try to make pancakes with the squash as the base. Keep in mind, I don’t have Internet at the farm, so I made this up completely; there might be a better recipe out there somewhere! First I chopped and cooked the squash in the awesome Lodge cast iron dutch oven over the fire so that it was nice and squishy and mashed with a potato masher. The next morning, I mixed some whole grain pancake batter, corn meal, one egg from our chickens, and cinnamon and folded in the wild harvested blueberries with the squished squash. They took a little while to cook through, but held together well and tasted delicious, a little sweeter than normal pancakes. We topped them with Vermont maple syrup. 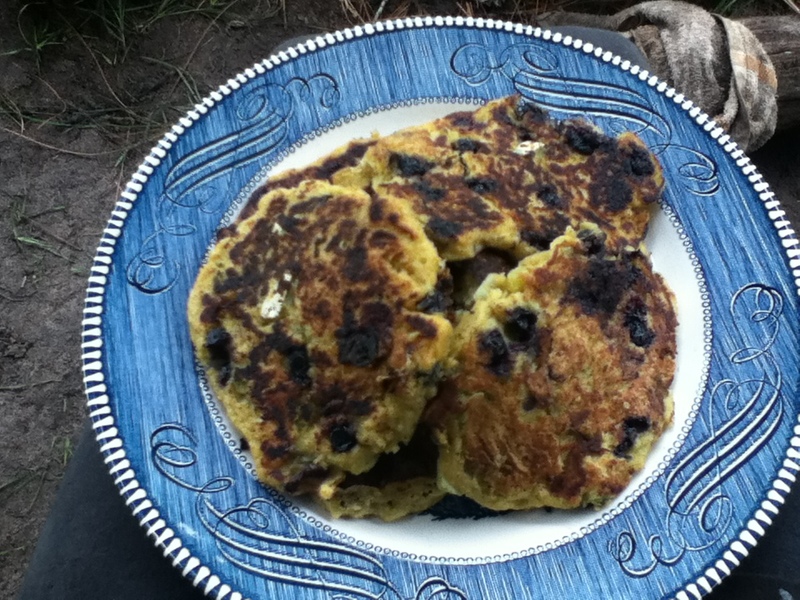 I definitely see more squash blueberry pancakes in my future – there’s still another half of our huge squash to eat up! 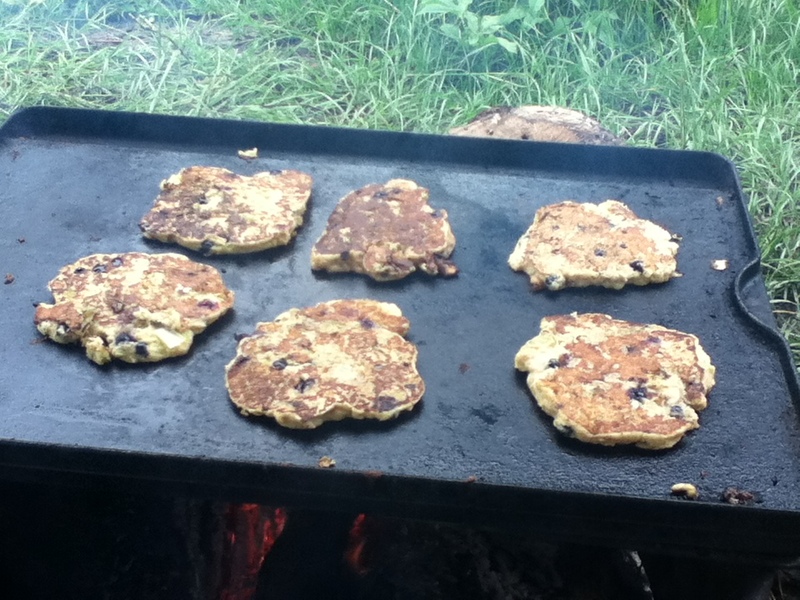 This entry was posted on June 28, 2012 by malrae in breakfast, minimalism, sustainable, WWOOF and tagged pancakes.